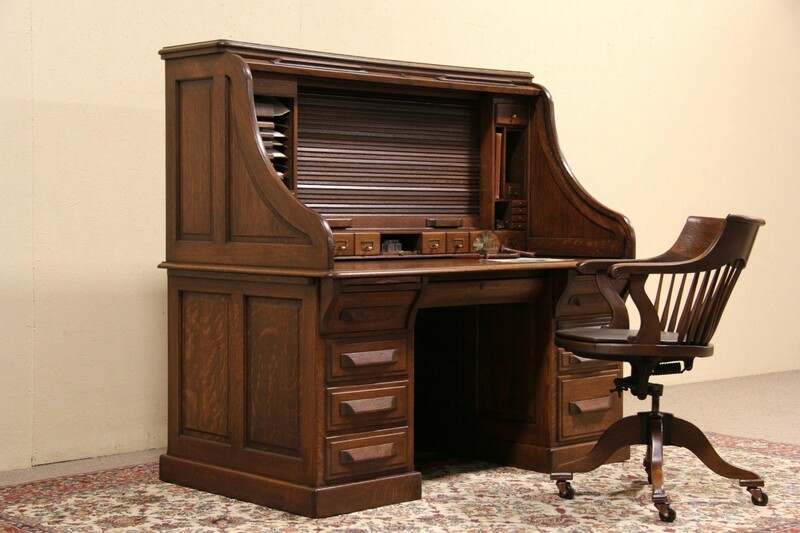 One of the finest roll top desks we have ever seen, this 1900 antique solid quarter sawn oak "S" curve desk with raised panels all around is spectacular. A second interior roll top inside covers a blank panel of unknown use, perhaps for photos or a bulletin board or in today's world, a monitor. We have joked that this desk seems to be made for a successful booky, numerous tiny drawers, slots and files could have held gambling slips, and the inside roll could cover sensitive papers. The deep brown handrubbed finish is in very fine condition. Long drawers have some replaced bottom panels. Two pull out shelves offer extra workspace. This American made antique furniture disassembles for easier moving. Measurements are 5' long, 3' deep, 57 1/2" tall, the desktop is 29 1/2" high and the kneehole is 25" wide and 24" high.